When growing garlic, try planting it close to roses - it's said to enhance the perfume. No - garlic doesn't smell bad when it's growing – that was a joke. Growing garlic under peach trees will help prevent leaf curl it's said – that’s serious – so’s the bit about the roses – but not the smell. 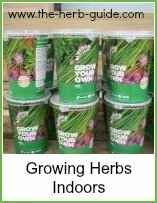 So you don't need to grow garlic just in the herb garden. It grows quite tall - 2 feet plus (60cm or more) and looks a bit like an onion top - it has a flower, which you need to nip out when you see it appearing. Select a sunny, sheltered site - garlic likes fertile, well drained soil. Peel off individual cloves and plant them flat end down - about 2 in (5 cm) deep and 6 in (15 cm) apart - leave 1 ft (30cm) between rows. Now the traditional time to plant garlic was early Spring but garlic is hardy and it's possible to plant it in late autumn instead. 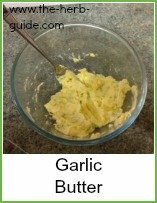 If you want garlic all year round, then plant one lot early autumn and another lot mid spring - harvest the garlic when all but 6 leaves have died down. The autumn planting will mature in summer and the spring planting will mature in late autumn. 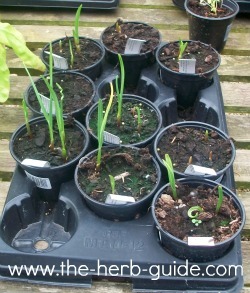 That should give you enough bulbs of garlic to see you through the winter and some spares to plant next season. Keep the growing garlic well watered until the leaves begin to die off – at that point, stop watering them and you’re probably about 10 days from harvesting. Leave until the outer leaves have died down to 6 in number before lifting and ‘curing’. Don’t let all the leaves die off or the garlic will have no ‘wrappers’ – the topmost leaves will be the ‘wrappers’ on the garlic. Lift the garlic bulbs, clean off the soil and lay them on the ground with their roots in the sun. It’s best not to wash them if you can help it – that’s why you need to stop watering before harvesting. If the sun shines, then leave them out for a day or so then move them into the shade. Hang somewhere dark after the initial drying phase – take off any dead leaves and just hang in a frost free place – shed, garage or similar. Tie about 10 or so bulbs together and hang in a dark airy place. After they are completely dried, trim the roots to about an inch and then store. 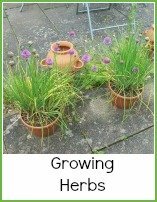 It is possible to grow garlic in pots outdoors and also indoors - there's a short video here which I made showing you how to do it. The most important thing to remember is that garlic takes around six months to grow to harvest, so you need to be patient.